On Monday, June 30, 2014 Save the Harbor/Save the Bay released its third annual Beaches Water Quality Report Card on the Boston Harbor Region’s public beaches from Nahant to Nantasket that are managed by the Department of Conservation and Recreation (DCR). The report card is based on an in-depth analysis of thousands of samples taken by the DCR and the Massachusetts Water Resources Authority (MWRA) in 2013. The samples were collected at 34 testing sites on public beaches in 9 communities including Nahant, Lynn, Revere, Winthrop, East Boston, South Boston, Dorchester, Quincy and Hull. The report card is based on methodology developed by Save the Harbor/Save the Bay’s Beaches Science Advisory Committee (BSAC), Co-Chaired by Dr. Judy Pederson of MIT’s Sea Grant Program and Dr. Jim Shine of the Harvard School of Public Health. Overall, water quality continues to be very good on most Boston Harbor region public beaches, however overall beach safety decreased sightly from 92.90% in 2012 to 90.45% in 2013, primarily as a result of wet weather. 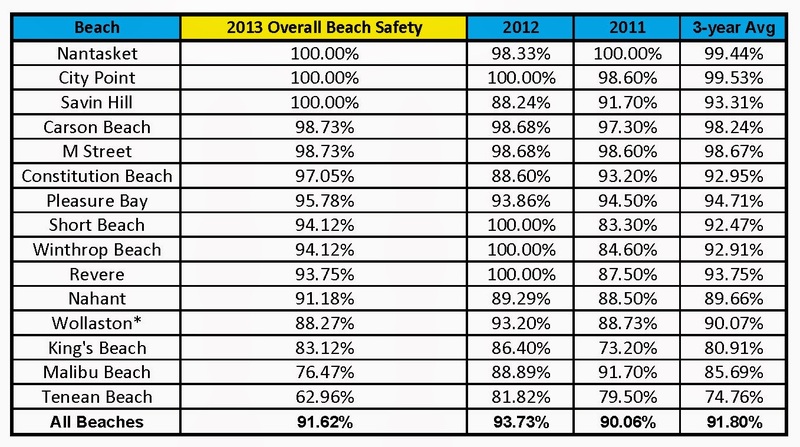 · For the third year in a row, South Boston received the top Overall Beach Safety score of beaches tested daily with 99.15%, followed by Constitution Beach in East Boston with 97.05% and Pleasure Bay with 95.61%. · For weekly tested beaches, Nantasket Beach in Hull tied with Savin Hill Beach in Dorchester to top the list with 100% Overall Beach Safety in 2013, followed by a tie for second between Short Beach in Revere and Winthrop Beach with 94.12%. · Revere Beach scored 93.75% in 2013, down from 100% in 2012, and Nahant scored 91.18% in 2013, a slight increase from 2012—both beaches are tested weekly. · Wollaston Beach in Quincy, tested daily, scored 88.27% in 2013, down from 93.20% in 2012. · King’s Beach in Lynn and Swampscott scored 83.12% in 2013, down from 86.40% in 2012, while Malibu Beach in Dorchester scored 76.47% in 2013, down from 88.89% in 2012. · Tenean Beach in Dorchester scored at the bottom of the list with 62.96% in 2013, down from 81.82% in 2012. According to Bruce Berman, Director of Strategy, Communication's and Programs at Save the Harbor/Save the Bay, the decrease in overall beach safety in 2013 is fairly easy to explain. "Bacterial pollution on these beaches is most often caused by storm water discharges that accompany summer showers, squalls and storms. 2013 was a very rainy year, with 20.88 inches of rain, nearly twice as much rain as in in the summer 2012, which was fairly dry with just 12.07 inches of rain." Save the Harbor is also pleased to note that Boston Water and Sewer's continued commitment to addressing illegal connections has resulted in improved water quality at Constitution Beach in East Boston, which achieved an overall beach safety rating of 97.05% in 2013, a substantial improvement over previous years despite the wet weather. Though water quality on many of the region's public beaches is great, Save the Harbor continues to be concerned about water quality at King's Beach in Lynn and Swampscot, and at both Tenean Beach and Malibu Beach in Dorchester, and to a lesser extent at Constitution Beach in East Boston and Wollaston Beach in Quincy. In 2014 Save the Harbor will continue to work with these communities to help them secure the resources they need to address these problems. Flagging accuracy continued to be a problem on area beaches in 2013, as it was in 2012 when we were forced to flunk the flags. You can find a nice piece on this subject by Larry Harmon of the Boston Globe by following this link. Overall flagging accuracy decreased slightly in 2013 from 2012. While blue flag accuracy remained fairly high, more than 50% of the red flags were still wrong on area beaches in 2013, as a result of the 24 hour delay between when the samples are taken and the results posted. In early June, the Massachusetts Department of Public Health amended the beach flagging protocol to reduce the number of incorrect red flags flown on the beaches. Save the Harbor supports that change, which you can read about here. We are confident that the new posting policy will improve the accuracy of the red flags, but also note that it will not improve water quality on these beaches. In 2014, Save the Harbor will continue to advocate for additional public investment to help local communities address persistent pollution problems that continue to close beaches in Lynn, Dorchester and Quincy. We will also continue to work with the Metropolitan Beaches Commission, and with DCR, MWRA, EPA, DEP, DPH and our Beaches Science Advisory Committee to develop more accurate models to better predict when to post or flag a beach. Save the Harbor / Save the Bay would like to thank Dr. Jim Shine and Dr. Judy Pederson, Co-Chairs of our Beaches Science Advisory Committee, Kelly Coughlin of the MWRA, DCR’s Gary Briere, and Save the Harbor’s water quality analyst Jacqueline Sussman and policy intern Yudan Jiang for their help with this report.